The project consists of over 1,000,000 sq.ft. above grade and ten acres of parking on four levels below grade. 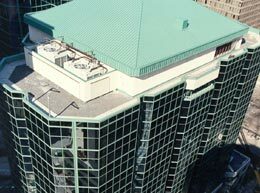 The 31 storey Suite Hotel has 240 units, with a convention centre, four banquet rooms. The Health Club includes the swimming pool, exercise rooms, and locker rooms. Food outlets include Noah’s Restaurant as the main dining room, the Dancing Mermaid Restaurant, Pita House, St. Cinnamon’s, and Hasty Market, the total area of 30 Retail Areas on Level One and Two is 160,000 sq.ft. The two 14 storey office towers have a total floor area of 520,000 sq.ft. A fast track construction program allowed occupancy of the first office tower fifteen months after design began.